On April 1, 1991, Ehud Barak was elevated to the rank of lieutenant general, becoming Israel's 14th chief of staff, and, at the age of 49, also the youngest in the history of the Israel Defense Forces (I.D.F.). In 1995, following the assassination of Yitzhak Rabin, Ehud Barak was named Israel's Foreign Minister. He became the leader of Israel's Labor Party in 1997. A list of Barak's numerous military postings and career promotions after joining the army in 1959 traces his steady rise to the top of the Israel Defense Forces (IDF) chain of command. His immense contributions to Israeli national security were signified by the awarding of an itur limofet, the army's medal for distinguished combat service, plus four other citations for valor in secret operations, the details of which remain classified. Ehud Barak was born in kibbutz Mishmar HaSharon in 1942. Soon after his IDF induction, when nearly 18, Ehud Barak was selected for the sayeret matkal elite special operations unit, going from platoon and company leader to its deputy commander and commander. During the 1967 Six Day War he commanded a mobile reconnaissance unit; in the 1969-1970 War of Attrition with Egypt along the Suez Canal he was in charge of an armored company; and during the 1973 Yom Kippur War he directed an armored battalion. Meanwhile, Barak's secret exploits included leading a squad disguised as airport maintenance men that successfully stormed a Sabena airliner hijacked to Tel-Aviv in May 1972, safely rescuing 97 hostages. A month later, his special operations team reportedly captured five Syrian officers who were on an inspection tour in southern Lebanon. In spring 1973 Barak participated in the daring IDF raid into central Beirut that eliminated three Palestinian extremist leaders masterminding Palestine Liberation Organization (PLO) terrorist activities against Israeli, Jewish, and European targets. In 1976 Barak took part in the celebrated Entebbe rescue, and he is believed to have planned the April 1988 assassination in Tunis of Abu Jihad, the PLO's operations chief. In 1974 Barak was appointed head of the IDF's Tank Commanders Course, and in the next six years he rotated from command of a regular armored battalion, a regular armored brigade, a reserve division and, finally, a regular division. Moving from field posts, in 1980 he directed the IDF Battalion Commander Course and then served in various staff positions, including both the General Headquarters' Intelligence Branch and the Operations Department. In grooming him for top command as a professional soldier, the army sponsored Barak's higher education. He earned a Bachelor of Science degree from the Hebrew University in Jerusalem in 1968, majoring in both physics and mathematics, and in 1978 he received an advanced Master of Science degree from Stanford University in systems analysis. Known for his sharp intellect and analytical skill, Barak was also an accomplished classical pianist and weekend gardener at his home in Kochav Yair, north of Tel-Aviv, where he lived with his wife and three daughters. Barak's career took another leap on January 1, 1982, when he was promoted to the rank of major general and appointed director of the General Headquarters Planning Branch. During the 1982 "Peace for Galilee" War he returned to a field command and was deputy leader of a formation that operated in the Beka'a Valley in eastern Lebanon. From there he went on to become chief of IDF military intelligence on April 15, 1983, a position he filled until January 19, 1986, and his appointment as commander of the Central Command. After a year in that position Barak, on May 7, 1987, was chosen deputy chief of staff under General Dan Shomron, succeeding him as chief of staff four years later. Ehud Barak pledged himself to restructuring the IDF, sensing that under the combined impact of the 1973 Yom Kippur trauma, the prolonged Lebanese intervention, and the added burden of coping with the intifada uprising in the annexed West Bank territories and Gaza Strip, the Israeli military had become a less-effective fighting machine. Convinced the army had become simply too large, too cumbersome, and too costly, he set about to fashion a smaller, more disciplined, and more mobile IDF, yet one equipped with and trained in the use of sophisticated state-of-the-art weaponry and capable of conducting multiple missions. This agenda involved Barak in a number of far-reaching issues and decisions. First was the need to formulate a longer range defense doctrine. Second, he needed to find ways of maximizing a shrinking defense budget. Next, in conjunction with the budget, he needed to adopt a weapons procurement policy that assured a supply of modern equipment on a cost-benefit basis while sustaining Israel's own indigenous military industries and weapons development program. In the fourth place he needed to strengthen a strategic relationship with the United States. Fifth and finally, it was necessary to help define the societal role of the IDF, which was traditionally regarded as the social equalizer in Israel, and whose changing manpower needs no longer could cope with the increasing numbers of 18-year-old young adults registering for military service. In the midst of preparing the Israeli army for possible war threats beyond the year 2000, General Barak was unexpectedly summoned to cope with the more immediate security implications of the September 1993 Israeli-Palestinian act of mutual recognition. According to the joint declaration of principles and timetable, Barak's IDF were called upon to effect a phased withdrawal from Gaza and Jericho, redeploying forces while continuing to assure the safety of Israeli settlers in the disputed territories as well as of Israel as a whole. Even before his scheduled retirement from the military, Ehud Barak was already touted as a natural contender for high political office as a prospective defense minister, and possibly even future prime minister. He made the transition to civilian life in 1994 at age 52 after 35 years of military service. The young chief of staff was taken into confidence by the late Yitzhak Rabin, then Prime Minister, who became a mentor to Barak. When Yitzhak Rabin was assassinated In 1995, Barak was appointed to the post of Foreign Minister by Shimon Peres, Rabin's successor. In 1996 Peres failed at his bid for election to the post, losing to Binyamin Netanyahu. Barak was then chosen on June 3, 1997 to replace Peres as leader of Israel's Labour Party. 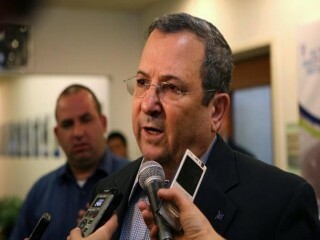 Barak favors a separatist compromise in the disputed territories of Israel and Palestine. He maintains an optimistic stance that a lasting peace can be realized without the sacrifice of Palestinian independence, but insists that Israel must retain an amount of the territory sufficient to insure perpetual security. He is a formidable contender to become the next Prime Minister of Israel in the elections that are scheduled for the year 2000. View the full website biography of Ehud Barak.